FlexNow is a softgel-based joint supplement from BSP Pharma. Its formulation revolves around a high-triterpene extract of shea nuts. We found no artificial dyes or coloring in FlexNow. Glucosamine Doesn’t have glucosamine. 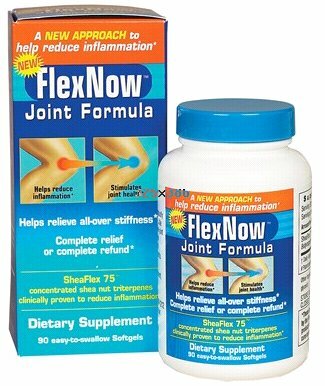 Glucosamine is a precursor to glycosaminoglycans which are a major component of joint cartilage. Chondroitin Sulfate Doesn’t have chondroitin. Chondroitin makes up glycosaminoglycans which are a component of cartilage. Boswellia serrata Doesn’t have boswellic acid. Boswellic acids are anti-inflammatory compounds. 5-LOXIN is an extract of acetyl-keto-beta-boswellic acid (AKBA), the most potent anti-inflammatory in Boswellia serrata. Curcumin Doesn’t have curcumin. Curcumin is used to reduce inflammation in Ayurvedic medicine.